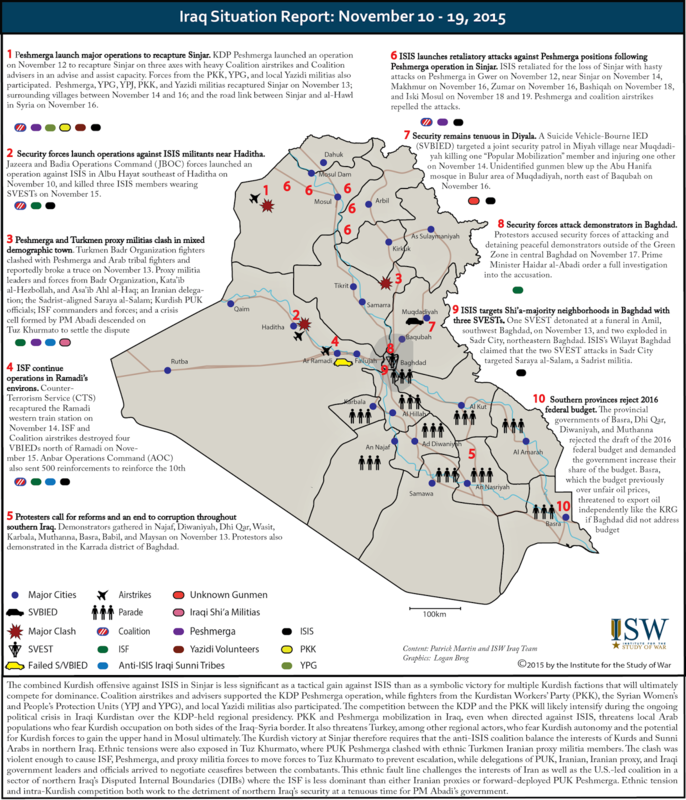 Key Takeaway: Kurdish forces recaptured the Yazidi-majority district of Sinjar, west of Mosul from ISIS on November 13. Confrontations between the Kurdistan Democratic Party (KDP) and the Kurdistan Workers’ Party (PKK) will grow increasingly likely as both seek to control Sinjar, while Kurdish control over the mixed-demographic district is already leading to heightened tensions between Yazidis and Sunni Arabs. Kurdish forces included Peshmerga affiliated with the Kurdistan Democratic Party (KDP); PKK-affiliated fighters from the Syrian People’s Protection Units (YPG); Kurdistan Workers’ Party (PKK) forces; and local Yazidi militias. The city of Sinjar remains under mixed KDP Peshmerga and PKK control. Areas east of the Sinjar were recaptured primarily by the Peshmerga, with the exception of Tel Qasab, a village southeast of Sinjar, which was captured by a YPG-affiliated Yazidi militia. However, areas west of Sinjar reportedly involved few Peshmerga. These areas remain primarily under the control of the PKK, YPG, and PKK-affiliated local Yazidi militias. Villages north of Sinjar and Sinjar Mountain contain forces from all Kurdish fighting forces excluding Peshmerga affiliated with the Patriotic Union of Kurdistan (PUK), and it is unclear as to what specific villages are controlled by which forces. Areas north of the mountain have been under mixed Peshmerga and PKK control since before the Sinjar operation, which ISW is retrospectively representing on this map. 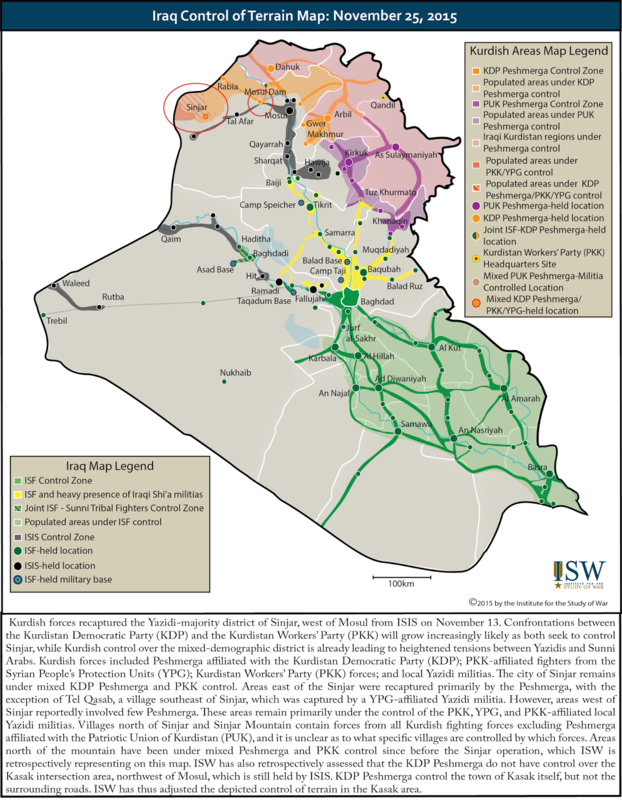 ISW has also retrospectively assessed that the KDP Peshmerga do not have control over the Kasak intersection area, northwest of Mosul, which is still held by ISIS. KDP Peshmerga control the town of Kasak itself, but not the surrounding roads. ISW has thus adjusted the depicted control of terrain in the Kasak area. Russia and Turkey have long been at odds over Syria, with Moscow backing President Bashar al Assad and Ankara supporting the opposition to overthrow him. Tensions increased dramatically with the start of the Russian air campaign on September 30. The Turkish shoot-down of a Russian combat aircraft on November 24 is an escalation in this tense stand-off between Russia and a NATO member. Although both sides may refrain from additional aggressive activities at once, tensions between Russia and Turkey have been continuously growing and are likely to expand, further testing the strength of the US commitment to its NATO partner. These tensions will also severely hinder efforts to build a "grand coalition" including Turkey and Russia. Turkey’s decision to fire on a Russian Su-24 that briefly violated its airspace resulted from more than concerns about the integrity of its borders. Russian airstrikes have been helping Assad, Hezbollah, and Iranian proxy forces advance in Turkmen areas near the Turkish border in recent days. Turkey claims that those airstrikes hit Turkmen villages. Turkey regards the Turkmen of Iraq and Syria as kin, works to protect and advance their interests, and tries to defend them. The Turkish shoot-down is probably intended to deter Putin from continuing to provide air support to Assad operations against them, among other things. The incident highlights the grand strategic implications of American policy in Syria, moreover. The West, led by France, has been drifting in the direction of cooperating if not allying with Putin, whom many wrongly believe is in Syria to fight ISIS. That drift empowers Putin and overlooks the larger objectives of Putin’s maneuvers, as Leon Aron points out. Putin aims to disrupt NATO fundamentally as part of a larger effort to recoup Russia’s losses following the collapse of the Soviet Union. He has been deliberately and aggressively prodding Turkey from his airbase in Syria, just as he has been consistently violating the airspace of US allies in the Baltics and US partners in Scandinavia. He is counting on Washington to remain so myopically focused on the fight against ISIS that it overlooks and tacitly accepts these assaults on the Western alliance structure. It would be an enormous mistake if we did so. This timeline is a joint presentation by the Institute for the Study of War (www.understandingwar.org) and the Critical Threats Project at the American Enterprise Institute (www.criticalthreats.org). The text is drawn from daily media tracking and analysis conducted by the superb analytical teams at ISW and CTP. The Syria Team at ISW includes Jennifer Cafarella, Christopher Kozak, and Genevieve Casagrande. The Ukraine/Russia Team is headed by Hugo Spaulding. This presentation was created by Frederick W. Kagan, director of the Critical Threats Project (fkagan@aei.org). 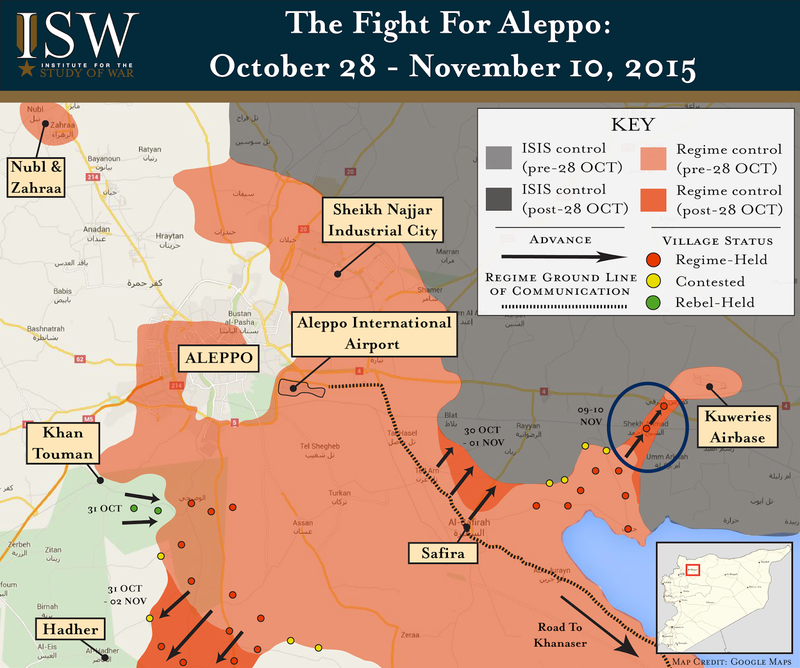 ISW analysts can be reached at press@understandingwar.org. Two Turkish F-16 planes shot down a Russian SU-24 jet on November 24 that Turkey claimed was in Turkish airspace and ignored repeated warnings. Two Russian pilots ejected from the plane, which reportedly crashed in the Turkmen village of Yamadi in Syria near the Turkish border. A minor Syrian rebel group affiliated with the Free Syrian Army named Brigade 10 released footage alleging to show a deceased Russian pilot. One additional pilot survived and is in hands of Turkmen forces in Syria according to unconfirmed reports. Turkish President Recep Erdogan called an emergency security meeting. NATO is also expected to hold an immediate meeting. Russia condemned the downing of the jet and warned of future consequences. The Russian Ministry of Defense confirmed the downing of the jet, but denied it had violated Turkish airspace. Russian President Vladmir Putin called the downing of the plane a "stab in the back" and promised “serious consequences...for Russian-Turkish relations.” Putin called the Turkish military the "accomplices of terrorists." He said at the end of his statement: “Do they want to make NATO serve ISIS? I understand that every state has its own regional interests and we’ve always respected that, but we will never allow the kind of crime that happened to today to take place.” Russian Foreign Minister Sergei Lavrov canceled his scheduled to visit Turkey for bilateral talks on November 25. The downing of the Russian jet followed Turkish warnings about its willingness to intervene to halt a renewed pro-regime offensive against a majority Turkmen area in Northeastern Latakia Province. Pro-regime forces supported by Hezbollah, Iranian-backed militias, and Russian airstrikes, and Russian artillery attacked rebel positions in the Mount Turkman region of Northeastern Latakia Province near the Turkish border on November 19. Fifteen hundred Turkmen refugees fled to the Turkish border by November 23, according to the governor of Turkey’s Hatay province, Ercan Topaca, who also claimed that the regime attack targeted 15 villages populated by a total of 35,000 civilians. Local activists immediately decried the attack, calling it the “Mount Turkman Massacre,” and the main Syrian political opposition group, the Syrian National Coalition, called for immediate rebel reinforcements to the area. Pro-regime forces have seized at least five villages and a number of hilltops in the Mount Turkman area amidst these ongoing clashes. Syrian al-Qaeda affiliate Jabhat al-Nusra is supporting Syrian rebel groups, including Syrian Turkmen, to defend against the regime’s attack. The complex mix of anti-regime groups in the Mount Turkman area helps legitimize Russia’s claim to be assisting pro-regime forces eliminate “terrorists” in Syria despite the fact that Russia and pro-regime forces are intentionally targeting civilian areas. The commander of a new Turkmen rebel group named the Sultan Abd al-Hamid Brigade, established in January 2015, denied the scale of the regime’s advance, claiming that rebel forces continue to control major strategic positions throughout the area. Turkey formally protested these developments and stated that it would not tolerate a worsening situation in the Mount Turkman area. Turkey summoned the Russian Ambassador on November 20 to demand an end to the military operation, warning that Russian airstrikes against civilian Syrian Turkmen villages “could lead to serious consequences.” Turkish political and security officials met two days later in a security summit to discuss the regime’s offensive. Turkish Prime Minister Ahmet Davutoglu announced Turkey will "not hesitate" to take necessary action to protect Turkmen populations on Syrian soil, and added that Turkish security forces “have been instructed to retaliate against any development that would threaten Turkey’s border security.” Davutoglu added that “If there is an attack that would lead to an intense influx of refugees to Turkey, required measures would be taken both inside Syria and Turkey.” Turkish Foreign Minister Sinirlioglu contacted U.S. Secretary of State John Kerry and sent a letter to Britain, which holds the UNSC presidency, calling for a U.N. Security Council meeting to address the issue. The incident could affect prospects for a successful negotiated settlement in Syria, at minimum. Turkey is a major supporter of Syrian armed opposition groups to include both Turkmen and Arab groups. Turkey continues to call for the removal of Syrian President Bashar al-Assad from power, which Russia is maneuvering to prevent through the framework of the Vienna negotiations. Continued Russian support to pro-regime offensives targeting Syrian territory of concern to Turkey may disincentivize Turkey from agreeing to halt the violence in Syria. Key Takeaway: Russia shifted its air campaign in an effort to mimic the U.S.-led anti-ISIS coalition's recent offensive to target ISIS-run oil and natural gas infrastructure from November 18-19. Russian military chief of staff Col. Gen. Andrey Kartapolov announced on November 18 "Russian warplanes are now flying on a free hunt" against ISIS-operated oil tanker trucks traveling back and forth from Syria and Iraq, claiming that Russian strikes had destroyed over 500 ISIS-operated oil trucks in the past "several days." This claim follows a November 16 U.S.-led coalition strike near Deir ez-Zour, which destroyed at least 116 ISIS-operated oil tanker trucks. The Russian Ministry of Defense (MoD) claimed that its long-range warplanes based in southern Russia conducted strikes against ISIS in both Deir ez-Zour and ar Raqqa Provinces. There was a notable influx of Russian strikes in the countryside of Deir ez-Zour, an area crucial to ISIS’s oil revenue. Local reporting has not yet substantiated claims of Russian airstrikes in ar Raqqa. French warplanes, however, continued to heavily bombard ISIS’s position in ar Raqqa from November 18-19. The targeting of ISIS-held oil infrastructure will allow Russia to present its interests as aligned with Western countries such as France despite Russia’s continued targeting of Syrian armed opposition groups in support of the Syrian regime’s ground campaign. Russia's recent escalation against ISIS in Deir ez-Zour may also be intended to demonstrate the irrelevance of the U.S.'s newest initiative inside Syria. Russia continues to use its intensified air campaign in Syria to position itself as an effective anti-ISIS actor amongst the international community. The Russian Ministry of Defense (MoD) claimed to carry out 253 sorties from the Bassel al-Assad International Airport in Latakia as well as its base located along Russia’s southern border with Georgia, doubling the average number of sorties flown each day. The Russian Ministry of Defense (MoD) claimed that long-range warplanes fired 50 cruise missiles against ISIS in Aleppo, Idlib, and Deir ez-Zour Provinces. However, cruise missile strikes have thus far only been documented against rebel-held terrain in northern Idlib and western Aleppo Provinces. Russian warplanes continued to carry out airstrikes against rebel positions in Latakia, Hama, Idlib, and Dera’a Provinces in support of regime ground operations. Russia continues to indiscriminately target civilians and continues to provide air support to pro-regime forces, including Iranian-backed proxy groups. The Russian air campaign in Syria primarily supports the Assad regime’s efforts against the armed opposition despite Russia’s recent increase in strikes against ISIS targets. The following graphic depicts ISW’s assessment of Russian airstrike and cruise missile locations based on reports from local Syrian activist networks, Syrian state-run media, and statements by Russian and Western officials. 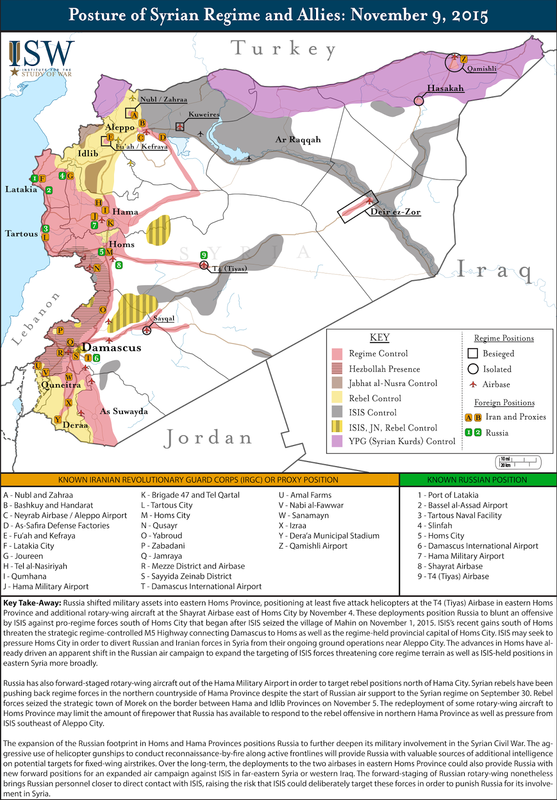 Key Take-Away: The combined Kurdish offensive against ISIS in Sinjar is less significant as a tactical gain against ISIS than as a symbolic victory for multiple Kurdish factions that will ultimately compete for dominance. Coalition airstrikes and advisers supported the KDP Peshmerga operation, while fighters from the Kurdistan Workers’ Party (PKK), the Syrian Women’s and People’s Protection Units (YPJ and YPG), and local Yazidi militias also participated. The competition between the KDP and the PKK will likely intensify during the ongoing political crisis in Iraqi Kurdistan over the KDP-held regional presidency. PKK and Peshmerga mobilization in Iraq, even when directed against ISIS, threatens local Arab populations who fear Kurdish occupation on both sides of the Iraq-Syria border. It also threatens Turkey, among other regional actors, who fear Kurdish autonomy and the potential for Kurdish forces to gain the upper hand in Mosul ultimately. The Kurdish victory at Sinjar therefore requires that the anti-ISIS coalition balance the interests of Kurds and Sunni Arabs in northern Iraq. Ethnic tensions were also exposed in Tuz Khurmato, where PUK Peshmerga clashed with ethnic Turkmen Iranian proxy militia members. The clash was violent enough to cause ISF, Peshmerga, and proxy militia forces to move forces to Tuz Khurmato to prevent escalation, while delegations of PUK, Iranian, Iranian proxy, and Iraqi government leaders and officials arrived to negotiate ceasefires between the combatants. This ethnic fault line challenges the interests of Iran as well as the U.S.-led coalition in a sector of northern Iraq’s Disputed Internal Boundaries (DIBs) where the ISF is less dominant than either Iranian proxies or forward-deployed PUK Peshmerga. Ethnic tension and intra-Kurdish competition both work to the detriment of northern Iraq’s security at a tenuous time for PM Abadi’s government. Key Takeaway: Russia announced a new phase of its air campaign in Syria on November 17 following a new directive from Russian President Vladimir Putin. This new directive comes as FSB Director Alexander Bortnikov confirmed the downing of Metrojet Flight 9268 to be “a terrorist act.” President Putin vowed to “punish” those responsible and stated that the Russian air campaign in Syria “must be intensified in such a way that the criminals understand that retribution is inevitable." The Russian Ministry of Defense (MoD) announced that the new air operations plan will double the size of Russia’s strike force able to target positions inside of Syria to include 25 long-range strategic bombers, 8 SU-34s, and 4 SU-27s. These new warplanes will be based from the Mozdok airbase in Northern Ossetia along Russia’s southern border with Georgia and flown over Iranian and Iraqi airspace to launch operations inside Syria. The new phase will also include an increased number of combat sorties from the Bassel al-Assad International Airport in Latakia Province. Russian Minister of Defense Sergey Shoygu reported during a briefing with President Putin that 12 long-range Tu-95 bombers carried out airstrikes against ISIS' positions in ar Raqqa and Deir ez-Zour on November 17. One Tu-160 and one Tu-95 fired 34 Kalibr cruise missiles at targets in Aleppo and Idlib Provinces on November 17. The U.S. was alerted of Russia’s intention to use sea-based cruise missiles in addition to long-range aircraft prior to these strikes according to an anonymous U.S. defense official. Multiple sources including the Russian MoD and the French MoD stated that Russia used cruise missiles to strike ISIS positions in Raqqa. French newspaper Le Monde reported that Russia launched cruise missiles from the Mediterranean, citing anonymous sources. The Kremlin did not confirm cruise missiles targeting ISIS in ar Raqqa. Local ground reporting only confirmed cruise missile strikes against rebel positions in Idlib and Aleppo Provinces with some local Syrian sources reporting that the missiles were fired from the direction of the Mediterranean. 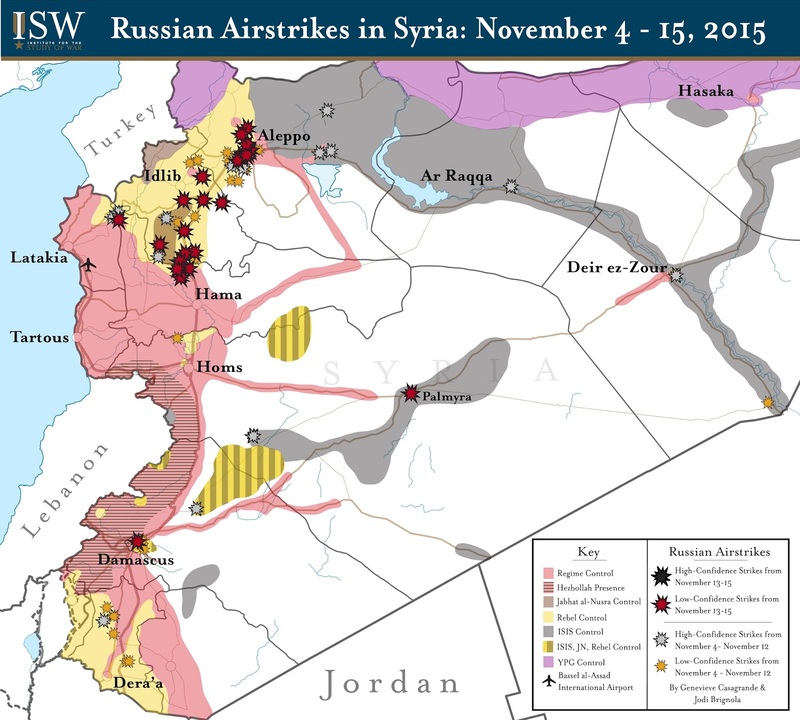 Notably, the majority of Russian airstrikes from November 16-17 targeted rebel positions, not ISIS. Russia’s intensified air campaign may open the opportunity for Russia to continue its efforts to draw Western countries into a new counterterrorism coalition in the Middle East. French Defense Minister Jean Yves Le Drian stated that the cruise missile strikes near ar Raqqa may indicate “this grand coalition with Russia is possible.” Increased airstrikes by both France and Russia prelude further cooperation between the two countries. Russia will continue to present itself as an effective anti-ISIS actor in Syria to the international community, despite the continuous low number of Russian airstrikes targeting core ISIS terrain. The following graphic depicts ISW’s assessment of Russian airstrike locations based on reports from local Syrian activist networks, Syrian state-run media, and statements by Russian and Western officials. The recent influx in Russian strikes throughout Syria caused a notable inflection in ground reporting as well as discrepancies within Western and Russian media sources. Those strikes that have been reported inconsistently from news sources deemed reliable within the past 48-hours are represented by an “Unknown Russian Strike” categorization. Instances of cruise missiles are only depicted if reliable picture or video documentation of the missile has been released. Key Takeaway: Russia continues to prioritize the preservation of the Assad regime rather than the defeat of ISIS through its air campaign in Syria. Russian airstrikes primarily supported regime ground operations against the Syrian armed opposition from November 13 – 15, concentrating in the southern countryside of Aleppo and the northern countryside of while pro-regime ground forces attempted to advance. ISW assessed Russian airstrikes against only one ISIS-held location with low-confidence during the reporting period. Meanwhile, the French Ministry of Defense announced French aircraft dropped 20 bombs against ISIS in ar Raqqa on November 15 in retaliation for the violent string of terrorist attacks carried out by ISIS in Paris on November 13. Russia will likely leverage the Paris attacks to drive its efforts to form a new counterterrorism coalition in the Middle East. Russia will continue to present itself as a decisive partner against ISIS in Syria to the international community, despite the relatively low number of Russian airstrikes targeting core ISIS terrain. The Russian air campaign in Syria is accelerating the radicalization of the Syrian armed opposition. The brutality of the Assad regime against civilian populations throughout four years of armed conflict has driven rebels into partnerships with Syrian al-Qaeda affiliate Jabhat al-Nusra, a powerful anti-Assad ground force. Russia’s air campaign uses similarly indiscriminate tactics against civilians. U.S. officials have confirmed the Russian use of cluster munitionsagainst populated locations in Hama and Idlib Provinces. Open source reporting indicates the use of cluster munitions in Aleppo Province as well. Russian airstrikes have reportedly killed over 254 civilians from September 30 – October 26 alone, according to the Syrian Network for Human Rights. Russian airstrikes reportedly targeted at least 12 medical facilities throughout Syria, according to statements from Doctors Without Borders on October 29. Local sources also reported the use of white phosphorus during Russian airstrikes in Idlib Province on November 12. Russia’s violent intervention is already driving the unification of rebels under powerful jihadist and hardline elements of the armed opposition. Three rebel groups made up of foreign fighters pledged allegiance to Jabhat al-Nusra from September 23 to October 3, and three groups merged under hardline Islamist Ahrar al-Sham beginning in early September 2015 following reports of increased Russian presence in Syria. The following graphic depicts ISW’s assessment of Russian airstrike locations based on reports from local Syrian activist networks, Syrian state-run media, and statements by Russian and Western officials. Key Takeaway: The Russian air campaign continued to support regime ground operations against the Syrian opposition in Aleppo, Latakia, Idlib, Hama, and Dera’a Provinces from November 11 - 12. Russian warplanes targeted rebel-held terrain in the southern Aleppo countryside, enabling pro-regime forces to seize the towns of al-Hader and al-Eis located southwest of Aleppo City on November 12. Russian warplanes began to bombard both of these towns on October 15 in conjunction with the start of the regime’s ground offensive against rebels in the area. These advances have brought the regime and its allies within sixteen miles of the two besieged Shi’a-majority towns of Fua’h and Kafraya in northeastern Idlib Province. Iraqi Shi’a militia Harakat Hezbollah al-Nujaba claimed that the group is preparing for operations to break the rebel siege on these two towns. Russian warplanes began targeting rebel-held towns surrounding Fu’ah and Kafraya on November 4. These reported airstrikes violate terms of a UN-implemented ceasefire established on September 24. Local sources also reported the use of white phosphorus during Russian airstrikes near the Jebel Zawiya mountain range in southern Idlib Province on November 12. The Russian Ministry of Defense (MoD) announced the expansion of its air campaign into Dera’a Province. ISW assessed Russian airstrikes against one location in Dera’a Province with high-confidence and five others with low-confidence from November 11 – 12, the largest concentration of reported Russian strikes in Dera'a since the start of Russian airstrikes on September 30. Local sources began reporting instances of Russian airstrikes in Dera’a Province as early as October 28. The influx in reported strikes follows reports of regime mobilization for an upcoming offensive near the Golan Heights. Israeli warplanes later conducted at least one airstrike near the Damascus International Airport on November 11 targeting an alleged weapon shipment intended for Lebanese Hezbollah. Continued Israeli targeting of Iranian proxy forces in Syria could exert additional pressure on Russia’s relations with Iran and the Syrian regime, particularly if Russia received advance warning of the strike through the Russian-Israeli air coordination mechanism established on September 21. Approaching the besieged enclaves from the east provides a more accessible target than pushing from the south through core rebel-held terrain in Idlib Province. **One Russian airstrike location from November 2 – 10 has been changed from low- to high-confidence as a result of additional reporting. Operations to clear Sinjar of ISIS may sow the seeds of future Arab-Kurd conflict in Iraq and Syria. Current dynamics in Iraq and Syria threaten to sow the seeds of future Arab-Kurd conflict. The U.S.-led anti-ISIS coalition depends on Kurdish forces as a primary ground partner in both Iraq and Syria. Iraqi Kurdish forces will soon launch an offensive to retake the ISIS-held town of Sinjar in northwestern Iraq near the Syrian border with support from the U.S.-led anti-ISIS coalition. Kurds and Arabs have historically contested the town, which Kurds sometimes refer to as a land-bridge to Syria. Arab-Kurdish violence in Iraq could reignite even as ISIS loses terrain. Meanwhile, Syrian Arab fighters operating alongside Kurdish forces in northern Syria attacked the ISIS-held town of al-Hawl near the Iraqi border west of Sinjar. Syrian Kurdish forces have nonetheless faced persistent accusations of "ethnic cleansing" against Arab civilians during operations to clear ISIS-held areas in Northern Syria. Arab-Kurdish tensions in both countries will grow if Kurdish forces attempt to seize other disputed regions. Competition over territorial gains could fuel intra-Kurdish conflict, both between Iraqi and Syrian Kurds as well as within the divided Iraqi Kurdistan Regional Government (KRG). Continued Kurdish expansion will also face strong opposition from Turkey. Turkish President Recep Erdogan pledged to take a harsh stance against the outlawed Kurdistan Workers' Party (PKK) across the border in Iraq and Syria after successfully consolidating his political power in parliamentary elections. The ISF is approaching three important infrastructural facilities around Ramadi: the Ramadi Barrage, the Warrar Dam, and the Palestine Bridge. Control over these locations is necessary to cut off ISIS’s supply routes into the city as well as to prepare for future operation to recapture the downtown area. The ISF are advancing towards the Palestine Bridge (2) that connects Albu Thiab area north of Ramadi with the city’s western environs. The ISF are likely advancing towards the bridge from both the east and the west, though this has not been confirmed. Seizing the bridge is important in order to prevent ISIS from using the Euphrates River to resupply its positions in Ramadi, according to the U.S. military. The ISF are also advancing towards the former Anbar Operations Command (AOC) headquarters compound (8) north of Ramadi, likely from Albu Faraj area east of the compound. The AOC headquarters is a strategic position that overlooks the ISIS-controlled Warrar Dam (4), a key dam that controls Euphrates River water levels and acts as a bridge into Warrar neighborhood in central Ramadi. If the ISF secure the AOC headquarters and approaches the Dam, they will cut off ISIS’s ground access to Ramadi from the north and secure an important facility and access point into the center of the city. Security forces also continued operations to encircle Ramadi and the ISIS-held Ta’mim neighborhood area from the west. The ISF advanced into the Glass Factory area (9) on November 8. This area is adjacent to the Ramadi Barrage (3), a dam that controls water flow to Lake Habaniya, south of Ramadi, and acts as a bridge into the Warrar neighborhood. If the ISF can hold the Glass Factory and approach the Ramadi Barrage, they would overlook multiple access points into central Ramadi: from the west over the Ramadi Barrage; from the north over Albu Faraj Bridge; and from the Anbar University area and the southern axis. 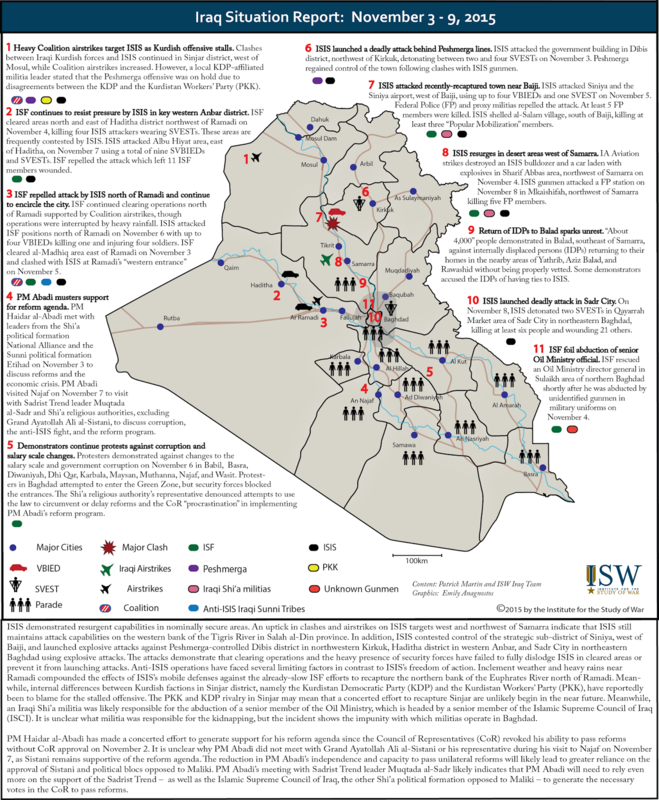 ISW will monitor both whether the ISF around Ramadi ensure that cleared areas remain cleared and the capacity of forward-deployed ISF units to resist ISIS’s counter-attacks. 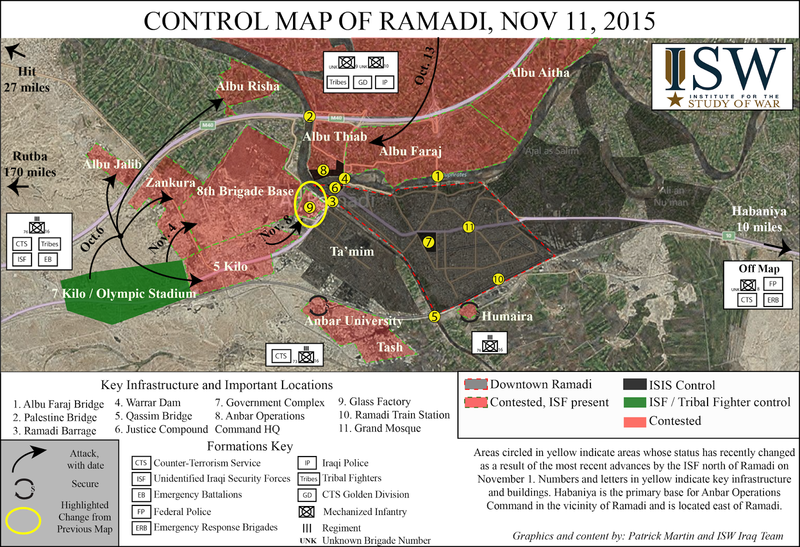 The ISF’s seizure of key infrastructure around the city will set important conditions in the operation to recapture Ramadi from ISIS. Key Takeaway: Russian airstrikes continued to support regime ground operations in Aleppo, Hama, Homs, Idlib, and Dera’a from November 9 - 10. Pro-regime forces relieved several hundred regime soldiers besieged by ISIS in the Kuweires Airbase east of Aleppo City on November 10 with air support provided by Russian warplanes. 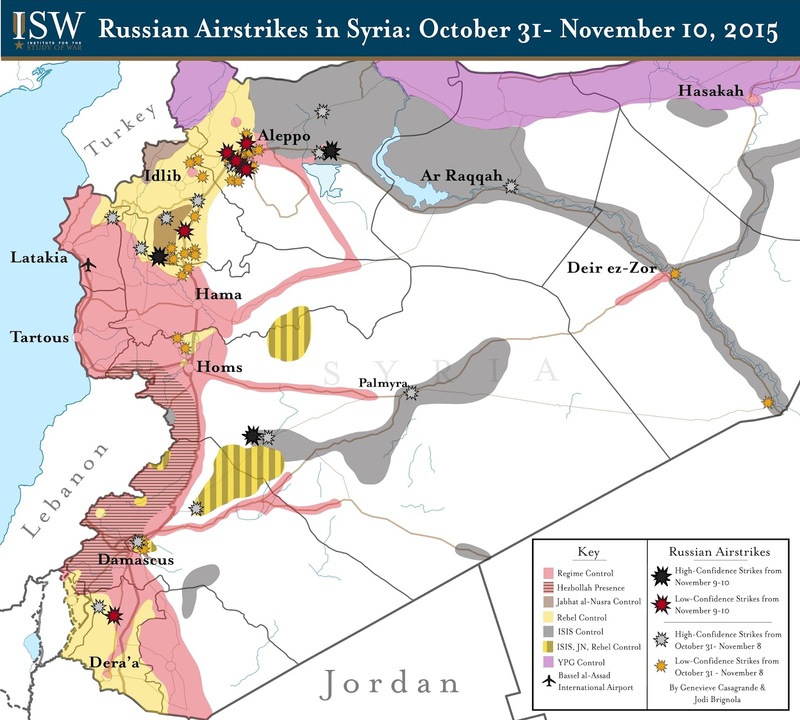 Russian airstrikes began to target ISIS’s positions surrounding Kuweires Airbase on October 12, preceding the start of the regime’s ground campaign against Kuweires on October 15. The regime largely relied upon Russian air power as well as reinforcement from hundreds of Iranian-backed proxy forces. The breaking of the siege represents a significant psychological victory for the regime and its allies. Russia will likely use this victory to validate its intervention in Syria and portray itself and the regime as decisive forces against ISIS in Syria. Russian airstrikes also continued to target rebel-held terrain south of Aleppo City as pro-regime forces continue to push southwest towards the town of Hader. Russian airstrikes targeted Syrian opposition forces in Hama and Idlib Provinces from November 9 - 10 as rebels continued to make gains against regime forces following rebels’ seizure of the town of Morek in northern Hama Province on November 4. Regime forces have in fact lost terrain in Hama Province since the start of Russian airstrikes in Syria on September 30. 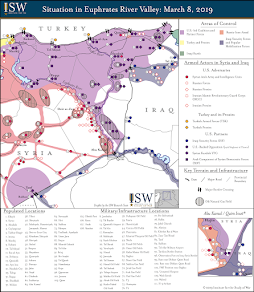 U.S. support to Syrian rebels has also largely assisted rebel advances in Hama Province. The U.S. provided increased shipments of TOW anti-tank missiles to “moderate” Syrian opposition groups following Russia’s intervention. U.S.-backed rebels launched a total of 115 TOW missiles in the month of October alone. Russian warplanes allegedly targeted the city of Inkhel 50 km north of Dera’a city amidst reports of a buildup of regime military forces in northwestern Dera’a Province. Pro-regime military buildup in southern Syria may indicate the regime’s intent to launch a future offensive to retake the town of Tel Harra in northwest Dera’a, which housed a joint Syrian-Russian signals intelligence (SIGINT) base before rebels seized Tel Harra in October 2014. 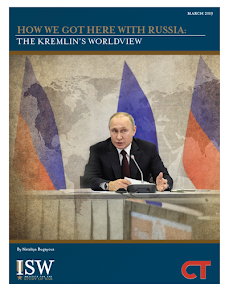 These reports raise the question of future Russian support towards an Iranian backed regime offensive near the Golan Heights in Southern Syria, particularly in light of recent Russian agreements with Syria’s southern neighbors Israel and Jordan. The Syrian regime and its allies reestablished a ground line of communication (GLOC) to the hitherto-besieged Kuweires Airbase east of Aleppo City in their first significant victory since the start of the Russian air campaign in Syria on September 30. Activist sources and Syrian state television reported that an advance party of regime forces established contact with several hundred Syrian Army soldiers besieged by ISIS in Kuweires Airbase on November 10 after seizing the adjacent village of Kuweires al-Sharqi. Clashes are reportedly ongoing as newly-arrived regime reinforcements attempt to expand the base’s defensive perimeter. The advance marks the culmination of one component of a multi-pronged offensive which began on October 15. The success of the operation relied heavily upon Russian air support as well as reinforcement from hundreds of Iranian-backed proxy fighters. U.S. officials previously reported in mid-October that up to 2,000 Iranian, Hezbollah, and Iraqi Shi’a militia fighters had massed southeast of Aleppo City in order to participate in ongoing offensives targeting Kuweires Airbase as well as rebel-held terrain in the southern Aleppo countryside. The successful relief of the regime forces trapped in Kuweires Airbase will provide a powerful morale boost to the military forces loyal to Syrian President Bashar al-Assad. The operation constitutes a much-needed symbolic victory for the Syrian regime following major territorial losses in the first half of 2015 as well as an initial lack of significant progress following the Russian intervention. The rescue of several hundred Syrian Army soldiers who have been besieged since December 2012 will tamper simmering discontent regarding his conduct of the Syrian Civil War. Alawite populations along the Syrian Coast – a core base of popular support for the Syrian regime – organized several protests this summer criticizing the government for failing to relieve Kuweires Airbase and other besieged pro-regime enclaves in northern Syria. The Syrian regime’s operational intent following the offensive to secure Kuweires Airbase remains unclear. Kuweires Airbase provides no tangible benefit to the Syrian Air Force, which maintains a well-defended and functional airfield at the Aleppo International Airport thirty kilometers to the west. The position of the base itself, however, provides a potential staging ground for regime forces to conduct follow-on operations that challenge ISIS’s presence in eastern Aleppo Province. A continued presence in Kuweires Airbase could allow the Syrian regime to contest ISIS-held terrain on the eastern outskirts of Aleppo City as well as critical ISIS supply lines connecting ar-Raqqa City to the Turkish border. Claims that the elite Syrian Army ‘Tiger Forces’ will soon redeploy from Kuweires to Hama Province nevertheless suggest that the Syrian regime does not intend to use the airfield as a launch pad for major offensive operations in the near-future. The base also remains vulnerable to an ISIS counterattack unless regime forces can seize additional terrain to provide their salient with defense-in-depth. Alternatively, the Syrian regime may intend to withdraw from Kuweires Airbase after securing safe passage for the exfiltration of the base’s garrison. A withdrawal from the airfield would free significant amounts of manpower, equipment, and aerial resupply assets for use on other fronts. The advances east of Aleppo City nonetheless do little to change the immediate strategic outlook for President Assad. Pro-regime forces have thus far achieved only tactical gains throughout other parts of northwestern Syria despite expanded support from Russia and Iran. Meanwhile, rebel forces seized the operationally-significant town of Morek along the strategic M5 Highway on November 5 as part of a new offensive threatening regime-held Hama City. ISIS also continues to pressure key supply lines for the Syrian regime in both Homs and Aleppo Provinces. Activists reported that ISIS deployed a convoy of at least forty vehicles from ar-Raqqa City to eastern Aleppo Province on November 9 in a likely response to the imminent fall of Kuweires Airbase. These challenges suggest that the Syrian regime and its allies will struggle to translate symbolic gains into enduring operational success. Key Takeaway: The Russian Ministry of Defense (MoD) claimed airstrikes in Aleppo, Damascus, Idlib, Lattakia, Homs, Hama, and Raqqa from November 6 – November 8. Credible local sources substantiated strike claims in Aleppo, Damascus, Idlib, Homs, and Hama during this time period, but failed to verify reports of Russian airstrikes in Raqqa province. Russian airstrikes continued to support regime ground operations with limited effect. Russian warplanes targeted rebel-held territory in Aleppo city and in the southwestern Aleppo countryside amidst ongoing clashes between pro-regime and rebel forces in the area. Pro-regime forces have failed numerous attempts to advance on the ground. Russian airstrikes also targeted rebel-held territory in Idlib and Hama countrysides, likely in response to continued rebel advances in Northern Hama. Jabhat al-Nusra (JN) and rebel forces seized the strategic town of Morek, north of Hama City on November 4 and continued to make tactical gains in the surrounding villages including Ashtan and Um Hartayn on November 6. Rebel advances in Hama indicate that the Russian air campaign is insufficient to prevent rebel gains in the area amidst increased shipments of U.S. TOW anti-tank missiles to moderate rebels. It is possible that rebel forces are taking advantage of a decrease in Russian rotary wing air support following the deployment of Russian helicopters to the T4 (Tiyas) and Sharyat airbases in Homs on November 4. 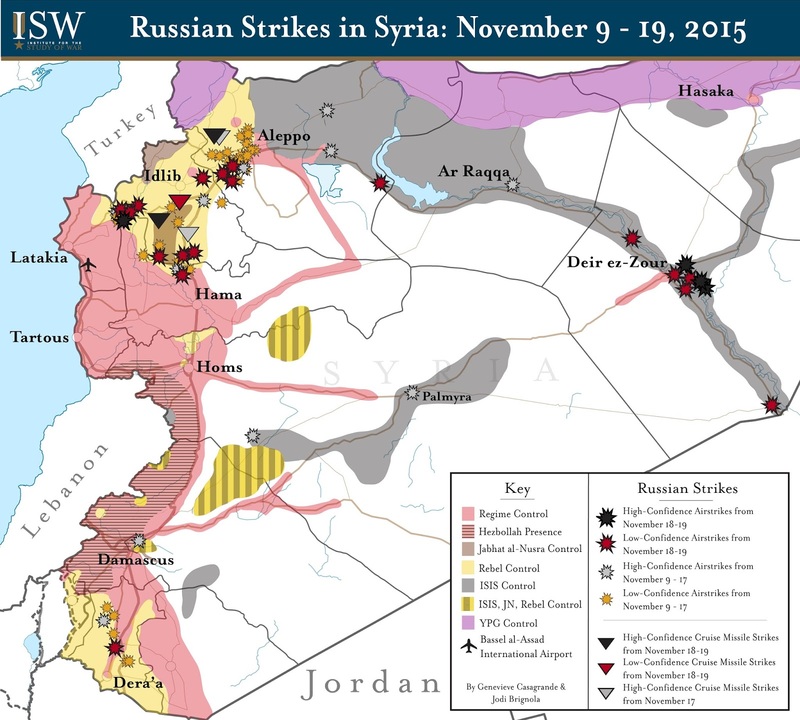 Russian airstrikes also targeted ISIS-held territory in Aleppo and Homs Provinces from November 6 to November 8. Russian warplanes targeted ISIS-held towns of al-Bab in Northeastern Aleppo and Palmyra and Maheen in Eastern Homs. Russian strikes near the Kuweires airbase east of Aleppo city, besieged by ISIS set conditions for a renewed regime advance toward the base after regime forces regained control of the Khanaser-Ithraya highway from ISIS on November 4. Re-establishing control of the highway allowed the regime to reinforce Kuweires and seize the village of Sheikh Ahmad, three kilometers south of the airbase on November 9. Coalition warplanes also targeted ISIS-held territory from November 6 to November 8, conducting strikes in Hasakah, Deir ez-Zour, and northern Aleppo. Both Russian and coalition airstrikes are therefore occurring in northern Aleppo and possibly Deir ez Zour and Raqqa against ISIS, exercising de-confliction and raising questions of varying effects upon ground conditions. Coalition airstrikes are precise, whereas Russian airstrikes continued to target civilian populations despite Russian claims to the contrary. Russian strikes on Douma in the Eastern Ghouta suburb of Damascus killed at least 23 civilians, including women and children on November 7. The strike follows recent regime aerial attacks in Douma, the stronghold of prominent Islamist group Jaysh al-Islam. The regime and Russia likely seek to disrupt an ongoing offensive by Jaysh al-Islam against pro-regime forces south of Douma near regime-held neighborhoods in Damascus.